Münster's historic Rathaus (right) dates to the 14th Century. Münster is a city of 280,000 in North Rhine-Westphalia, not far from Germany's border with the Netherlands. The city traces its history back to 793 A.D., when a monastery was founded in the area during the time of Emperor Charlemagne. Münster was granted the status of a civitas (city) in 805, and by 1494 it was associated with the Hanseatic League. 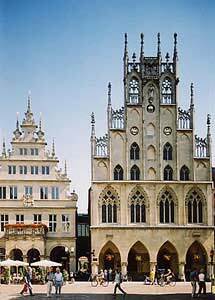 In the 16th Century, it was ruled by Anabaptists but became a Catholic city again during the Counter-Reformation. Münster's unofficial motto, "the city of the Westphalian peace," pays homage to its role in ending the Thirty Years War in the 17th Century. Together with nearby Osnabrück, Münster hosted the negotiations that brought that religious and political conflict to an end. You can visit the Friedensaal, or "Hall of Peace," in the city's old Rathaus (see photo above) to see where the negotiations took place. In World War II, 90% of the buildings in the Altstadt were destroyed by Allied bombing. After the war, the city government decided to rebuild the city on the medieval town plan. Today's Altstadt, or old town, is an attractive blend of repaired or restored old buildings and modern structures that fit into the winding, twisting medieval streetscape. Perhaps most impressive of all, there's nothing museum-like or Disneyesque about Münster's town center: It's a lively place where you can visit historic churches, dine in ancient restaurants, or shop for anything from English books to German baked goods to Laura Ashley dresses and Armani shirts. For more information about Münster's history, see the timeline from Münster Information (a.k.a. Münster Marketing).